Our 4" x 6" Cowpens stick flags are made from a high quality, silk-like polyester fabric. They feature a hemmed flag mounted on a black plastic 10 inch staff with a gilded spear point. 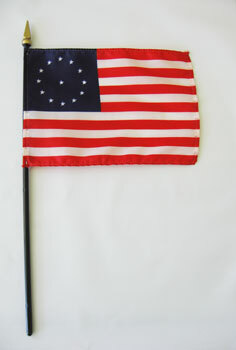 These versatile stick flags can be used on tabletops and desks, to wave in parades, or to decorate flower arrangements. This flag represented the first starred and striped flag that fulfilled the 1777 Flag Resolution. Twelve white stars were arranged in a circle and one star was centered in a blue field. It had seven red and six white stripes. It is known as ''Cowpens'' because the 3rd Maryland Regiment carried this flag when they fought at Cowpens, South Carolina, in January 1781.